This article will look at the Order of Battle for the 1st Australian Division and its landing at Anzac Cove on the 25th April 1915. Before that though, it will be useful to have a brief look at military organisation and structure in Australia prior to 1914, and the changes that were effected from August that year. The Federation of Australia in 1901 was followed, on 1st March 1904, by The Defence Act 1903. The provisions of this Act did not permit the establishment of a regular infantry force but rather recognised that the Commonwealth military forces would largely be based on a part-time militia. Known as the Citizens Forces or Citizen Military Forces and formed into sequentially numbered battalions, many of these men would later serve in the Australian Imperial Force battalions formed in 1914. The Australian Imperial Force (AIF) was a purely volunteer force formed on the 15th August 1914. Today it is known as the 1st AIF to distinguish it for the 2nd AIF which was raised on the 15th September 1939. Over 330,000 men served with the AIF during the First World War of whom close to 62,000 were killed and a further 150,000 wounded. Two divisions took part in the landing at Anzac Cove. These were the 1st Australian Division, commanded by Major-General William Throsby Bridges CMG, and the Australian and New Zealand Division, commanded by Major-General Sir Alexander Godley KCMG. Two companies each of the 9th, 10th and 11th Battalions constituted the first wave of men to land at Anzac Cove. The remaining two companies of the 9th, 10th and 11th Battalions, as well as the complete 12th Battalion (originally intended to be brigade reserve) formed the second wave of men to land at on the Gallipoli beaches. Arrived ashore over several days. Raised at Melbourne on 11th August 1914 as the divisional cavalry regiment for the 1st Division, the regiment was in fact mounted infantry. Did not take part in the Anzac Cove landing in April 1915 but was held back, landing between 22nd and 24th May. In common with the 4th Light Horse Regiment, the 2nd Light Horse Brigade remained in Egypt until May 1915 when it was deployed as reinforcements to replace the heavy casualties sustained at Gallipoli. 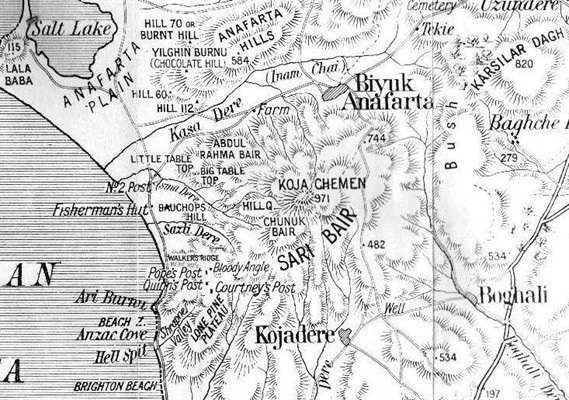 The map of Anzac Cove is published on the Gallipoli Association website.